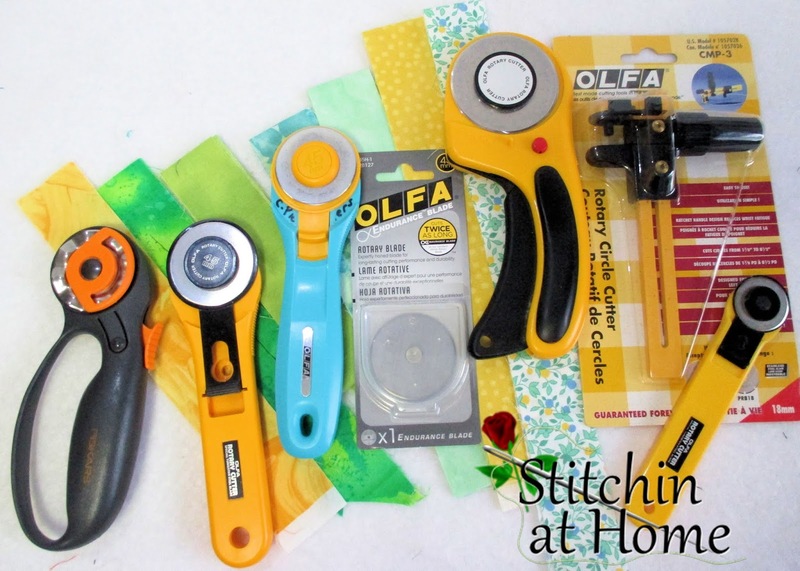 Stitchin At Home: How Many are too Many? While doing some straightening up, I realized I have a few rotary cutters. Okay maybe more than a few if I'm being honest. 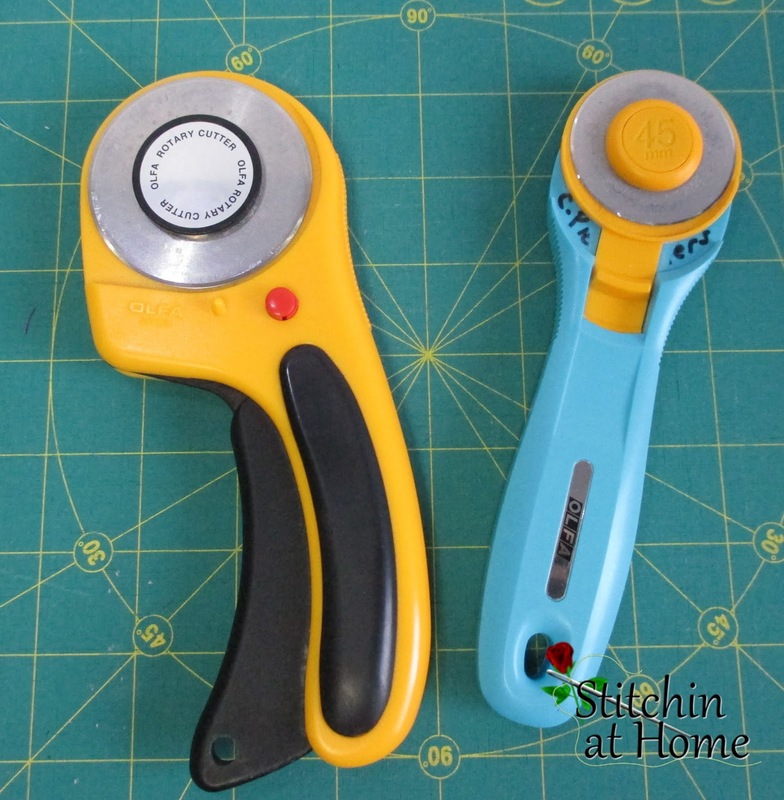 The cutter on the left is a Fiskars I don't really like it, I have a wave blade in it. I think it may have been one of the first ones I bought, years ago when I was first starting to quilt. Next up are the two rotary cutters I use the most. They are both Olfa my favourite brand. The 45mm is my most used cutter. A few months ago I purchased the endurance blades and I must say I'm liking it. I keep an old blade in this 45mm for trimming papers when doing paper piecing, I use freezer paper most of the time. 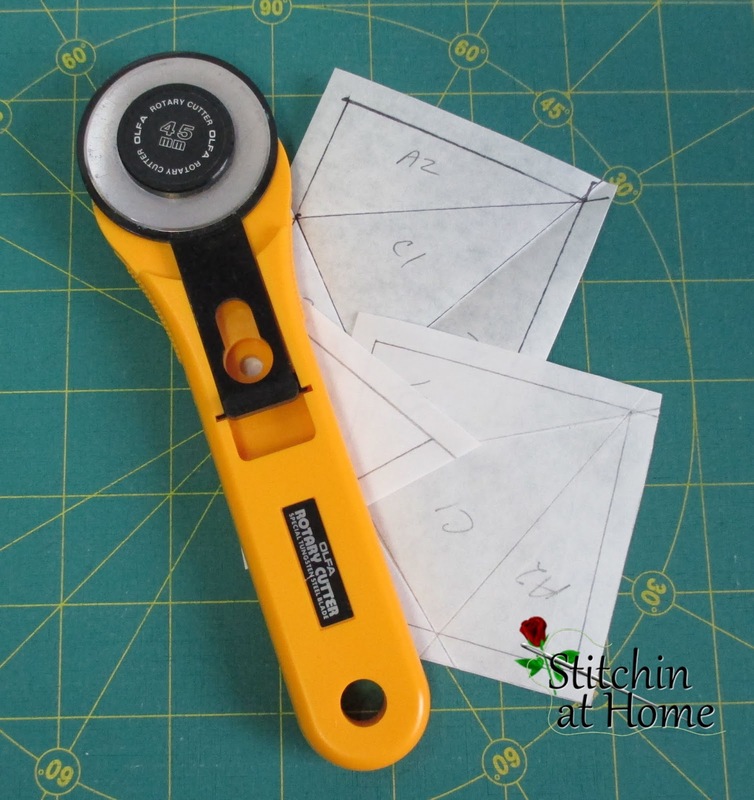 But I like to trim the papers up to size before using them, so this cutter comes in quite handy and is used a fair amount in my quilt making as I tend to like paper pieced patterns. What collection would be complete without a couple specialty rotary cutters in it? A 28mm and a circle rotary cutter and oh yes it has been out of the package and used. I like the small 28mm for cutting around templates. The small size goes around the templates easier than the 45mm. I just remembered I also have a 45mm Deluxe rotary cutter. Yup I do have a thing for rotary cutters. 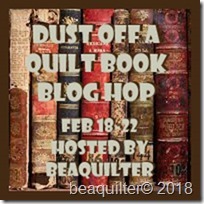 I'm participating in “Dust off a Quilt Book” Blog hop this month. Look for my post on February 19th. To see the list of those participating go to Beaquilter blog. So I ask you do you have a collection of rotary cutters or am alone in the rotary cutter collection world? I am amassing rotaries too. I get them in my Sew Sampler boxes. So far I've gained the pink, aqua and red 45mm, a 28mm Fiskars and I got a 28mm Olfa (which I already had) from a friend at Christmas. No plans to get rid of any yet, except possibly the Fiskars. 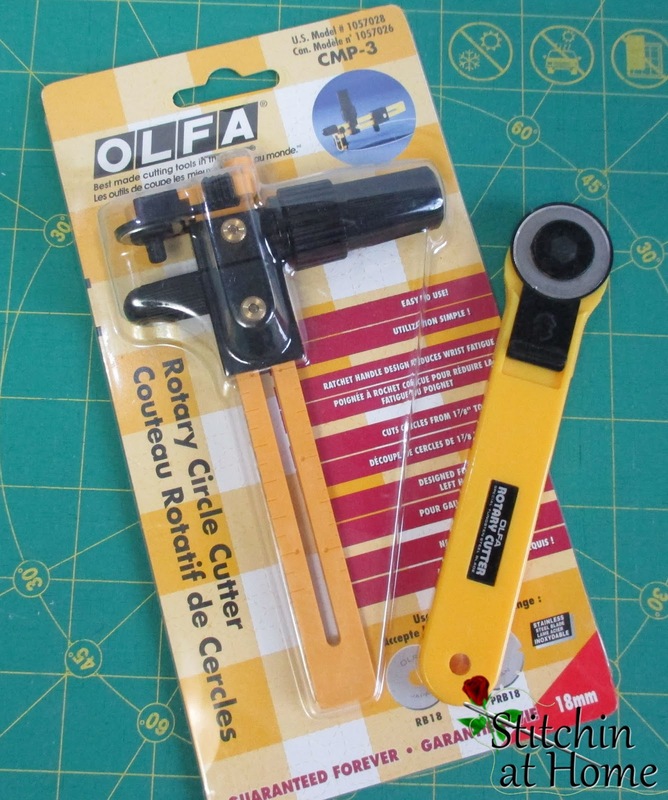 I have three rotary cutters--two 45mm olfas (One at home and one in my class tools bag) and one 18mm olfa. I keep looking at the new ones but haven't bought one yet. I might try to get one of the 40th anniversary cutters though. Also, one for paper would be nice so I didn't have to change out a blade. You are not alone. I have those cutters and just got a new Kai one from Massdrop that I have not tried out yet. I use the 18mm for paper cutting. The automatic closed I bought alfter slicing a finger but it was because my finger was over the edge of the ruler not just because it was open. 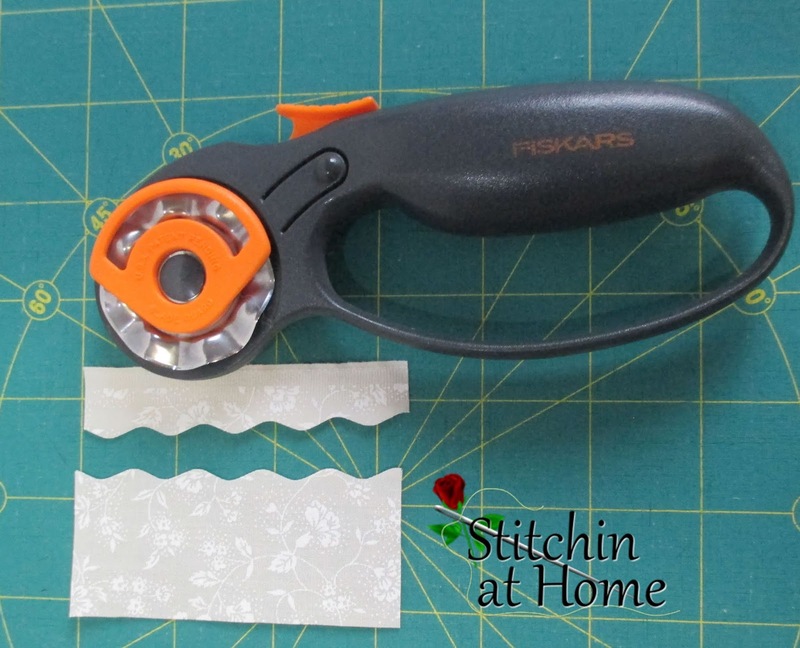 I haven’t used the Fiskars in quite a while. You are in good company. Well, I have three. One Olfa (my first and original) and two Martelli (one big and one small) but they came with the very expensive design table. Recently I acquired another one which came free with Connecting Threads order over a certain $$ amount. SO a total of four but honestly I bought just one of them. I need more blades and fewer cutters.